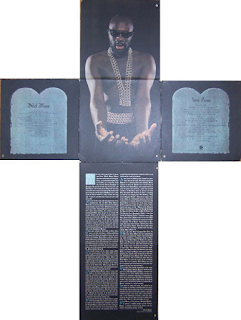 After the extended soul grooves, often of easy listening or other soul standards, on "Hot Buttered Soul" and "...To Be Continued", and the iconic movie soundtrack "Shaft", Isaac Hayes gave us this, his first double album. 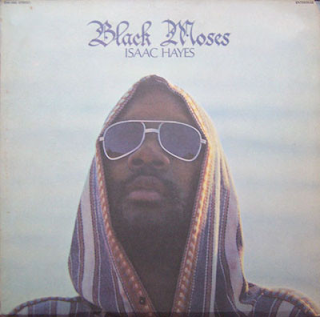 Basically, it was more of the same - lengthy, seductive soulful workouts immaculately played by The Bar-Kays and topped off with Hayes's deep, but honeyed vocals. The album is full of serious soul and funk. It doesn't have the social message of Marvin Gaye or Curtis Mayfield's material, or that of The Temptations or The Undisputed Truth, for that matter. What it has is love - big, late-night love. Without this as an inspiration, would there have been any Barry White sensual, semi-spoken "lay down on the couch, honey" numbers? Hayes wrote the book of "loverman" cliches with this. That is not to say that it is not seriously soulful, though. It is chock full of deep soul. Regarding its cultural effect - this was a soul artist putting out a very credible, uncommercial double album. Stuff like this really provided a landmark in the development of soul/black music. "Never Say Goodbye" is a deep, resonant version of the upbeat song made famous by The Jackson 5 and later by Gloria Gaynor. This ain't no disco number. It is a sultry slow burner. The cover of The Carpenters' "(They Long To Be) Close To You" doesn't really work for me and, for once, the accusation that it goes on too long holds some weight. It seems to lose the beauty of the original melody somewhat. "Nothing Takes The Place Of You" is a sumptuous, deep soul ballad with an almost slow rock 'n' roll-style piano backing. "Man's Temptation" is an organ and backing vocal driven groover, with a rumbling bass line and some funky wah-wah guitar. Hayes' vocal is supremely deep and warm. The beat on this is magnificently grinding, in an insistent, bassy fashion. It is addictive soul music of the highest quality. "Part-Time Love" is so deliciously funky. It has an almost reggae-like intro and some infectious percussion. It is another eight minute groove. This album was also notable for its three spoken "raps", which featured Hayes speaking a long, yearning intro over a subtle bass/keyboard backing before eventually launching into the song that is linked with each rap. The intros are very much in the style of the songs Barry White would specialise in just a few years later. His songs were more string orchestrated, though. Hayes's are more purely soulful in their bass, piano and drum backing. Strings are used, and brass too, but it that slow seductive bass rhythm that underpins the material. "Going In Circles" has that distinctive orchestration and guitar interjection sound that so characterised "Walk On By" on "Hot Buttered Soul". "Never Gonna Give You Up" is not the song that Barry White would later write. Strange that they both wrote songs with similar titles and the same sentiments and ambience. It is more of a smooth soul number than a gritty, funky one, actually in the Barry White mode. "Need To Belong To Someone" is a wonderful piece of melodic but grand soul. Hayes's vocals are simply superb here. He is not always given the credit he deserves for his vocals. "Good Love 6-9-9-6-9" is an upbeat, pounding slice of soul/rock that offers a different feel to much of the album. Great guitar on it too. "For The Good Times" is the easy-listening Perry Como song, and is done in suitably crooning fashion, but with a solid soul backing. "I'll Never Fall In Love In Again" is the Bacharach-David song made famous by Bobbie Gentry and Dionne Warwick. Hayes's version is suitably evocative. There is no doubt that this is a special album, although you only need to dip into a few tracks at a time to appreciate them as a whole sitting of the entire double album is just a little bit like eating too much sticky toffee pudding. Having said that, it does make you want to keep coming back for more.